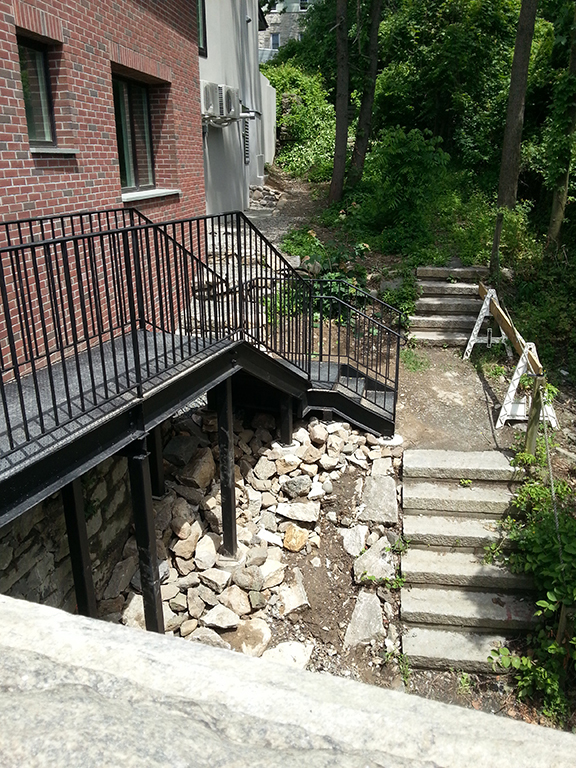 At the beginning of June, without fanfare, the long awaited stairway to and from the Quarry Trail to Warburton Avenue opened! Now, anyone on the Aqueduct Trail can walk down Quarry Trail and walk up the stairs to Warburton Avenue. Close by is Antoinette’s Patisserie, a Hasting’s favorite for its own brand of coffee, pastries and gelato. Also across the street from Antoinette’s is a shady park which is open to the public. Those familiar with the Quarry Trail know that it is currently only half complete, but, nevertheless passes via tunnels underneath the Aqueduct and Warburton Avenue before coming to an end. Some refer to it as the “trail to nowhere”, but the Village of Hastings will complete the trail down to Railroad Street when an approved state grant is funded. In the future, the old marble quarry to the east, and adjacent to, the OCA and Quarry Trails will be converted into a natural-setting park. The design has been completed and when sufficient funding is found the closed up quarry property will be re-purposed into a 5 acre park with easy access from the Aqueduct Trail and Draper Park.